I posted on Instagram yesterday a picture of Mont Blanc that we had for dessert. This delicious arrangement of chestnut cream, Chantilly and meringue has been a Christmas special in our family for as long as I can remember. My cousin Noha - a fabulous chef- prepared it. Her crispy white meringue is crunchy yet soft and chewy on the inside. The chestnut cream with hints of vanilla was superb. She did not add brandy because of the kids but some of us simply followed it with a few sips of Cognac. Although it is a popular and famous dessert in France, Mont Blanc was first cooked in Italy in the 15th century and was named Monte Bianco. It was a favourite of of Cesare and Lucrecia Borgia. About 100 years later Monte Bianco appeared in France and slowly became one of its most famous desserts. I have had many delicious Mont Blanc in my life but perhaps the one that sticks most to my mind was one with brandy flavoured chestnut cream at the famous Viennese patisserie Demel. Mont Blanc is as easy as you would like to be. 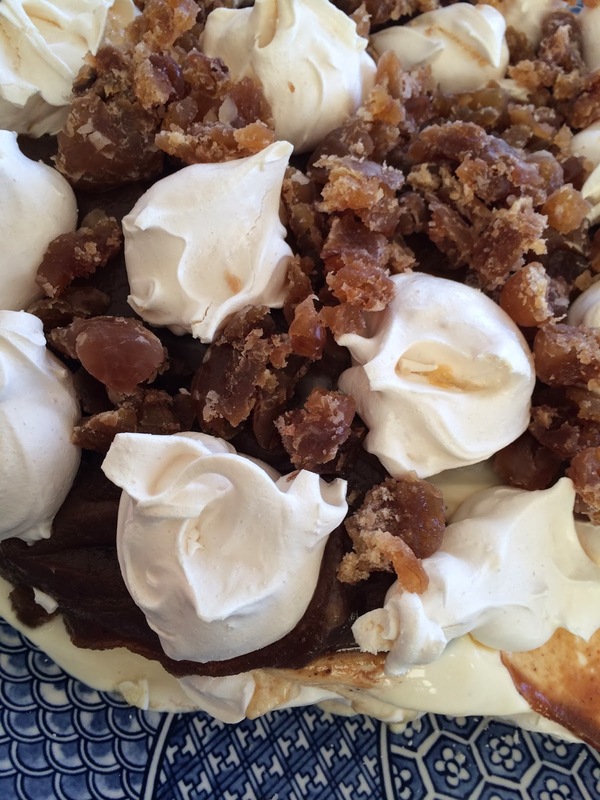 You can buy ready prepared chestnut cream and a good quality meringue and then put it together. Here is a recipe by the great Marcella Hazan. 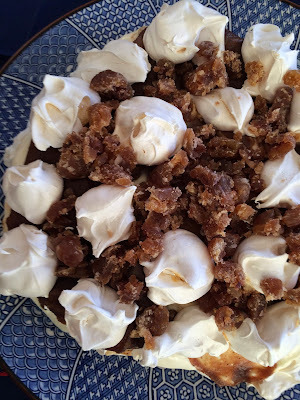 The recipe that I am listing below shows you how to make meringue but relies on canned chestnut cream and puree. I photographed Noha's Mont Blanc yesterday and used them here with here permission. Enjoy! 2. Whisk the egg whites until they begin to form soft peaks. 3. Fold in sugar and corn flour. 4. Keep whisking briskly and add the vinegar. Whisk until the mixture is thick and glossy. 5. Cover a baking sheet with parchment paper. Draw a circle of 20 cm and pipe the meringue inside it. Pipe the rest of the meringue mix into little portions the size of a walnut. Make sure there is enough space (about 2 cm) between each. 6. Bake for approximately 1 hour. If the meringues begin to colour lower the heat. 7. Meringues should be crisp on the outside and soft and chewy on the inside. 8. Place double cream, sugar and vanilla essence in a bowl and whip until soft peaks begin to form; refrigerate. 9. In another bowl, mix chestnut cream and puree together with brandy. 10.Whip the cream and fold it into the chestnut mixture. Refrigerate until ready to use. 11. When the meringue has cooled, spread the chestnut cream over it with a palette knife and decorate with the small meringue pieces. 12.Pipe the Chantilly cream buttons between the meringues; finally garnish with marrons glacés pieces. 13.Keep refrigerated until ready to use.